Preheat an air fryer to 356 degrees F (180 degrees C). Mix bread crumbs and oil together in a bowl. Stir until mixture becomes loose and crumbly. Dip fish fillets into the egg; shake off any excess. Dip fillets into the bread crumb mixture; coat evenly and fully. 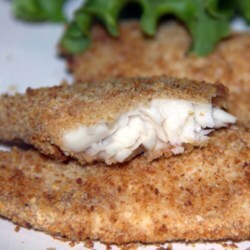 Lay coated fillets gently in the preheated air fryer. Cook until fish flakes easily with a fork, about 12 minutes. Garnish with lemon slices.